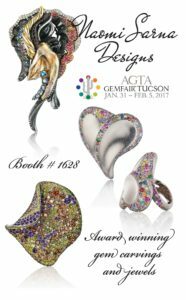 Naomi Sarna Designs is pleased to invite attendees at this year’s AGTA Tucson GemFair 2017 to visit our display at Booth #1628. Naomi will be personally attending and participating in this internationally-renowned annual event. A selection of her spectacular pieces, including this year’s award winners, will be shown at her exhibit on the main Expo floor at the Tucson Convention Center, 260 South Church, Tucson, Arizona 85701. Please feel free to join us January 31 through Feb 5 at this location. 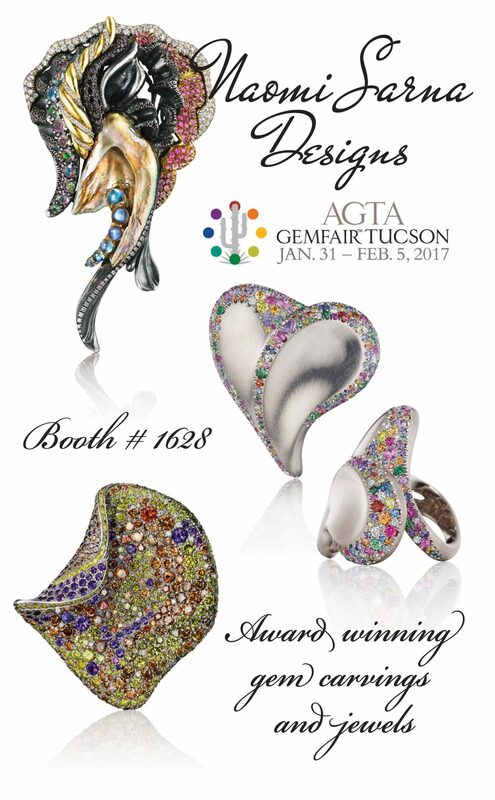 Naomi is deeply honored to be the recipient of three top awards at the Awards Ceremony on Friday, Feb 4th by the AGTA and WJA. Accolades at this year’s GemFair 2017 are for the Summer 2016 competition. Naomi’s prizes included 1st Place in Carving, the WJA Gem Diva Award, and an Honorable Mention for an additional piece in the Carving category. These awards move her into the ranks of the Association’s most honored designers. Her body of work is unique as it crosses over between high jewelry and objet d’art – a rare distinction. Summer 2016 Awards: Confetti Heart Ring WJA Gem Diva Award (left), Ametrine Carving 1st Place Carving, Rutilated Quartz Honorable Mention Carving. The Confetti Heart Ring won Naomi the 2017 Gem Diva Award. This represents the second such award given to her since receiving the Classic Wear Gem Diva award earlier in 2016. The award was granted by the Women’s Jewelry Association (WJA) in partnership with the AGTA Spectrum Awards. The supple and iridescent 297-carat Ametrine Carving won 1st Place in Carving. This piece epitomizes the careful selection and painstaking care Naomi takes to design and carve each one of her distinct handmade pieces. The 1,375-carat Rutilated Quartz Carving received an honorable mention in the carving competition as well. It is a spectacular specimen that shows Naomi’s appreciation for the beauty of nature’s extravagance with its stunning earth-toned inclusions. Please remember to visit us at Booth #1628! A variety of pieces and other information will be available for viewing and sale to the public. Contact us via email at info@naomisarna.com if you’d like to plan to personally meet with Naomi while at the show.